I recently installed Ubuntu and all has been great, except for the web apps feature. I've tried adding a few web apps, but it's very buggy and not a very good experience. I'm also tired of being asked to add a website as an web app. How can I remove web apps from Ubuntu entirely? I use both Chromium and Firefox. Tested on both releases with Firefox/Chromium + Launchpad, Facebook and Youtube. No popup asking for a webapp integration. If what you want is removing them, you can do it in two ways. With this method you should copy and paste the packages names. This will give you a list of all your webapps. Just remove the ones that you don't like with sudo apt-get remove packages. You should have installed aptitude by now with sudo apt-get install aptitude. 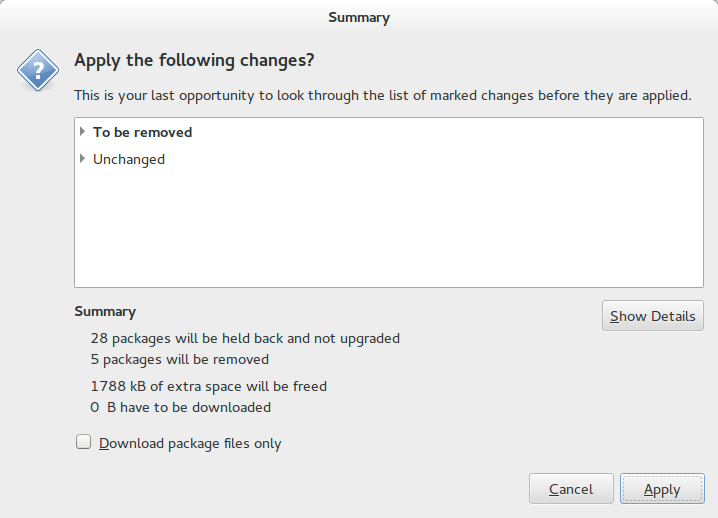 This will remove the ubuntu-desktop package and unity-asset-pool which may be undesirable. This will list all of your packages that began with unity-webapps Most of them will be webapps but not all (8). Do not remove the ones that it is not webapps this includes (libunity-webapps-dev, libunity-webapps-doc, libunity-webapps0, unity-webapps-common, unity-webapps-qml, unity-webapps-qml-doc unity-webapps-qml-examples, and the last one unity-webapps-service.) remove the ones that you what by sudo apt-get remove webapp1 webapp2... replace webappx with the name of the webapp that you want to get rad of. Note you can list them. 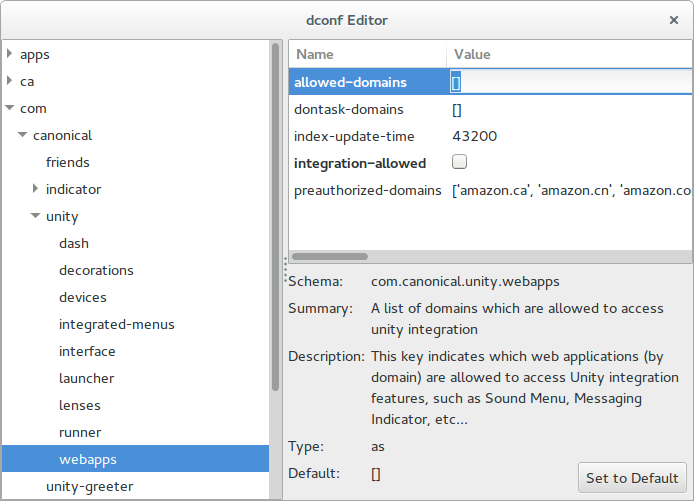 DO NOT REMOVE unity-webapps-common, and unity-webapps-service IT WILL REMOVE UNITY! 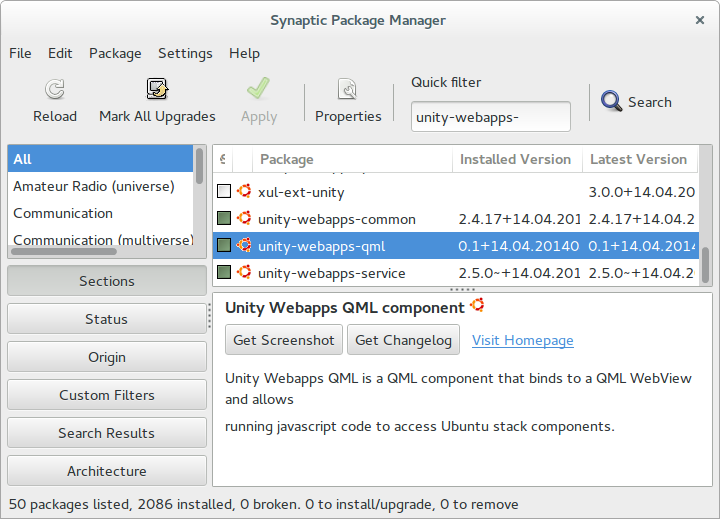 Open Synaptic Package Manager if you don't have it install fellow this instructions. 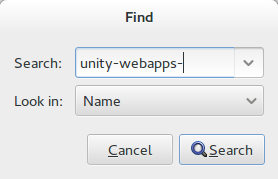 After that search for unity-webapps- by hitting on the button that says "search"
You will get a window like this. Just type in unity-webapps- into the text box. Than hit the button that says "search" Just hit the button that says "Mark" and keep doing it if it is necessary. After that Right click on any package that is green box next to it. The green box means it is installed. Select remove package to remove the webapp that you what to get rad of. If you want to get raid of all of them. Than research for xul-ext-unity, and unity-chromium-extension. 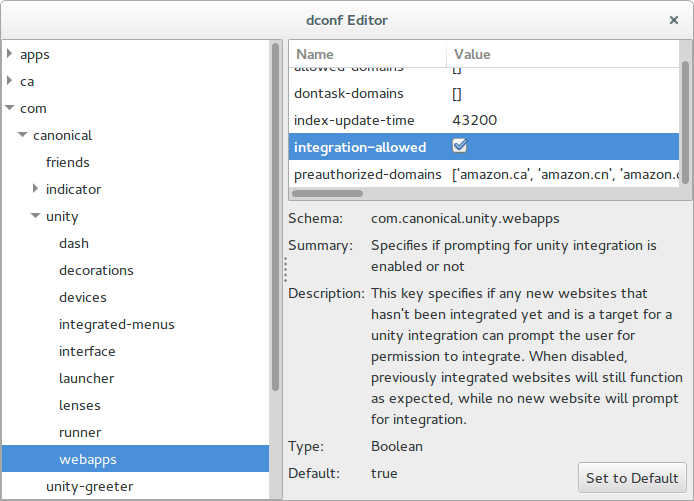 DO NOT REMOVE unity-webapps-common, and unity-webapps-service IT WILL REMOVE UNITY! After that, hit the button that says "Apply" And you will get a window like this, and just hit the button that says "Apply", too. Clear every thing in the string allowed domains by double clicking on it and it should change it from a text field to a textbox. Not the answer you're looking for? Browse other questions tagged unity webapps or ask your own question. 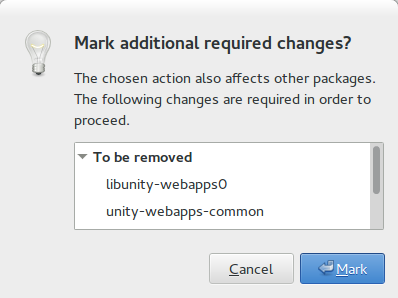 What's the right way to remove an Ubuntu Unity web application? What is dconf, what is its function, and how do I use it? How to remove the Unity Amazon package in 16.04? How do I run apps with options as icons from the dash? How do I remove duplicate Chromium extension: Unity Integration? How can I remove web-apps?